A fortunate win against the Spurs, in the tightest title race in years. The Reds now have their fate in their hands, potential champions as things stand. Again Real Madrid expresses interest, putting Liverpool’s resolve to the test. The Good, The Bad and The Ugly, another week reviewed at the world’s favourite football club Liverpool F.C. Refusing to give up and forcing a winner against Spurs on Sunday. Despite taking the lead with a Roberto Firmino header on 16 minutes, Liverpool went on to make hard work of a game that was always going to be a tight one. Lucas Mora took advantage of a flat-footed Liverpool defence to score the equaliser after 70 minutes and set up a nervy closing 20 minutes for the 55,000 spectators. The tension clearly got to Moussa Sissoko who missed what was the clearest of clear cut chances, ballooning his shot over the bar from five yards out. The hosts, however, showed why they top the Barclays Premier League with another late goal. This time courtesy of Toby Alderweireld’s hashed clearance from Mo Salah’s speculative headed centre. The Spurs players slumped to the ground at the final whistle. They too have much to play for with just one point separating sixth and third places. The expression tough at the top couldn’t be more relevant. Liverpool have a habit of making things difficult for themselves. Having taken the lead through Firmino, the world and his wife would have known they couldn’t close this one out. 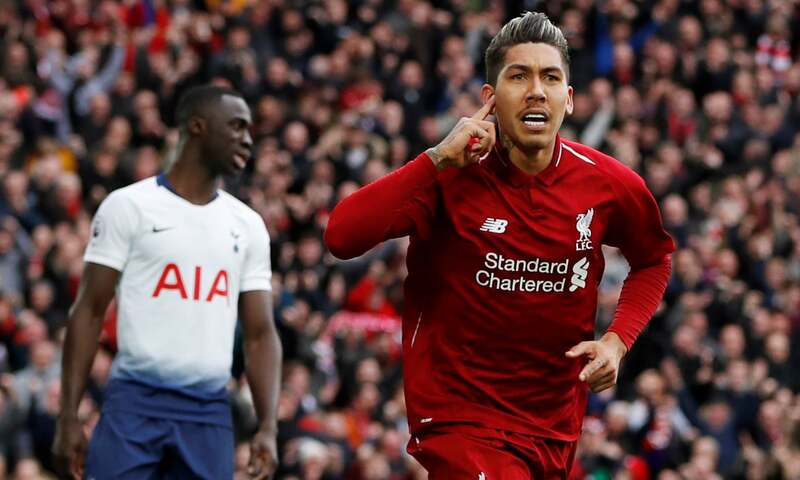 As they have done against Fulham, as they have done against West Ham, Leicester and others, Liverpool scored first, only to throw the lead away like a hot potato. If the Reds do go on to land the title, they’d deserve it on entertainment alone, I’d say. Never a dull moment with this side. As today’s game went on, I could see an equaliser coming. The second half was virtually all Tottenham as Mauricio Pochettino sent his side out to salvage something from this game. To be fair, apart from Sissoko’s mammoth miss, Dele Alli also went close. As things stand, should both Liverpool and Manchester City win their remaining games, Liverpool will still lose the race. Should that happen, they only have themselves to blame. Pretty ugly if reports in the Daily Mail are to be believed – a tough task I appreciate. Uglier than Rocky Balboa’s nose. The news that re-installed Real Madrid Manager Zinedine Zidane (v2.0) has targeted Sadio Mané as a potential recruit to the Santiago Bernabeu. The Senegalese forward has been instrumental in keeping Jürgen Klopp’s title hopes alive this season, disguising some less than convincing performances from the Reds. This may only be paper talk of course, but there’s no smoke without fire. And with FSG’s record for “reluctantly” cashing in once a player (inevitably) says how “flattered” he is etc, this doesn’t look good. Let’s see how this pans out.